In the old days, the braves were always fighting. Summertime, and the living was easy: what else was there for a boy to do? Quite a lot, actually. 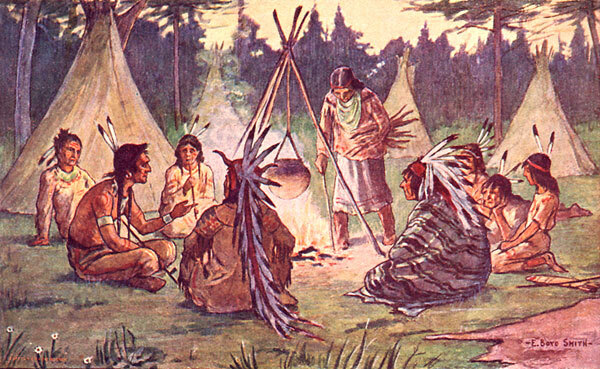 The Iroquois tribes who controlled lands along the Atlantic coast were renowned as hunters and warriors. This constant warfare was getting in the way of growing food. Their women told them to stop, but the braves refused to listen. Tribe fought with tribe, villages raided other villages, and even between families there were arguments. Fear and hatred reigned in the land and nobody was safe. Something needed to be done, so the people would not go hungry. 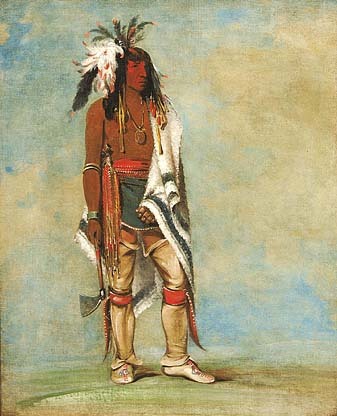 Haio Hwa Tha (‘He Who Makes Rivers’) was a Mohawk chief. Amongst these warring tribes, he was held to be the best fighter in the land. But Haio Hwa Tha was also revered by his people as a wise man. One summer day a Huron shaman named Deganawida arrived at his longhouse, seeking an audience. This was most unusual, and the tribe gathered together to hear him speak. “They have already heard my message of peace,” said Deganawida, and the Mohawk people then accepted his vision too. Haio Hwa Tha proposed that the tribes should unite in a peaceful federation, with a council of delegates and regular meetings for shared ceremonies. The League of the Long House, Haudenonsaunee, was founded by five tribes: the Mohawk, Oneida, Senecca, Cayuga and Onondagas peoples. The Confederacy had been going strong for at least fifty years when the Pilgrim Fathers arrived in 1621. The newcomers were impressed with this democratic system of government: popular history credits it with influencing the American Constitution. In 1854, Longfellow wrote in his diary, “I have at length hit upon a plan for a poem on the American Indians… It is to weave together their beautiful traditions as whole.” What he produced next year was ‘The Song of Hiawatha,’ a composite of myth, legend and folklore. At a time when many white people regarded the natives as savages, Longfellow’s lyrical lines were a hit. He evoked a traditional way of life where man lived in close harmony with the natural environment. Daughter of the Moon, Nokomis…. Read more about Longfellow: Father of historical fiction in guest post at Past Times Books. More stories in ‘LifeWorks‘ by Jane Bailey Bain. Follow Jane on Twitter @janebaileybain. If you like this post, use the buttons below to Share on Facebook, Twitter or Stumbleupon. 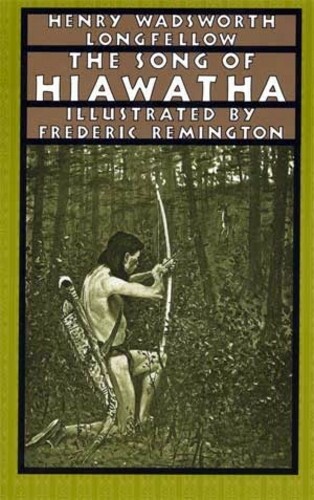 This entry was posted in History, LifeWorks, Mythology and tagged Deganawida, Haio Hwa Tha, Haudenonsaunee, Hiawatha, historical character, Iroquois, League of the Longhouse, Longfellow, Longhouse, Mohawk. Bookmark the permalink.